The U.S. Navy and the Japan Ground Self Defense Force conducted a joint military exercise last week in the Philippine Sea. The U.S. Navy and troops of the Japan Ground Self Defense Force’s (JGSDF) recently stood up Amphibious Rapid Deployment Brigade (ARDB) have conducted joint amphibious operations as a part of exercise Kaagapay Ng Mga Mandirigma Ng Dagat (KAMANDAG) 2, a bilateral, U.S.-Philippine, military training exercise, in the Philippine Sea. This year, ARDB elements are participating in humanitarian assistance and disaster response (HADR) training of KAMANDAG 2. The exercise also includes amphibious warfare operations, counterterrorism, and live-fire training, jungle survival and combat lifesaving training jointly conducted by Philippine and U.S. forces. The exercise marks the first time that a U.S. Navy warship, the Whidbey Island-class dock landing ship USS Ashland, conducted amphibious operations with ARDB troops. The ARDB was activated in April 2018. 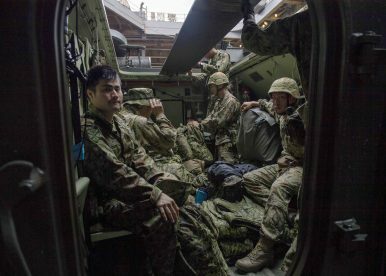 “This is a milestone achievement and a significant step forward in capability development for Japan’s newly established amphibious force,” said Rear Admiral Brad Cooper, the commander of the U.S. Navy’s Amphibious Force 7th Fleet. The initial size of the brigade will be around 2,000 troops, but this is slated to increase to 3,000 once the force becomes fully operational sometime in 2018. The new brigade’s principal mission will be to defend the 6,000 islands and islets of the Ryukyu Islands chain, which stretches southwest from Kyushu to Taiwan. Seven hundred troops of the light infantry regiment are currently charged with defending the remote islands. However, the establishment of the new unit has been plagued by inter-service rivalry, budgetary constraints, and the Japan Self-Defense Force’s traditional problem of a lack of inter-service coordination, which, given that any amphibious warfare operation will require all three services to cooperate, may prove particularly problematic. Indeed, the ARDB currently lacks a sufficient number of operational Assault Amphibious Vehicles (AAV) 7s (only 15 out of 52 are currently operationally deployed) and there are also delays in the induction of V-22 Ospreys, next to public opposition to the stationing of the accident-prone rotorcraft near the ARDBs home at Saga airport in southwestern Japan. In January, ARDB soldiers also participated in a bilateral amphibious training exercise, codenamed Iron Fist, hosted by the United States Marine Corps (USMC).